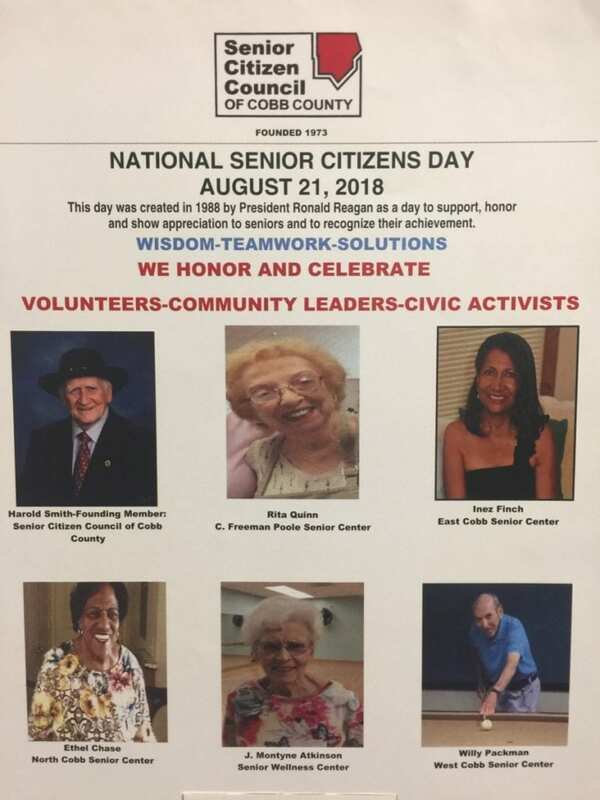 The Senior Citizen Council of Cobb County will honor six Cobb citizens at a luncheon to celebrate National Senior Citizens Day. The event will be held next Tuesday, August 21, 11:30 a.m. at the Cobb Senior Wellness Center, 150 Powder Springs St SW, Marietta, 30064. Rock Step Nation-RARC Line Dancers, Big Chicken Quartet, and The Footloose Players of C. Freeman Poole will provide entertainment. National Senior Citizens Day was started in 1988 by President Ronald Reagan. It was proclaimed as a day to show appreciation to seniors and to recognize their achievements. Mike Boyce, the chairman of the Cobb County Board of Commissioners, will present a formal congratulatory proclamation to each honoree. The Honorees were selected by the Senior Citizen Council’s Board of Directors and by member votes from their respective Cobb Senior Center. Harold Smith is a 1973 founding member of the Senior Citizen Council of Cobb County. He also organized and directed the popular senior education program Enrichment of Life Movement (ELM). Harold and his wife founded the Smyrna Historical and Genealogical Society Museum and he is often there as he continues his involvement in amassing and poring through artifacts and memorabilia of days past. Rita Quinn of C. Freeman Poole Senior Center has been affiliated with the center for 30 years and has founded several clubs including dance and exercise activities. Rita is currently the president of Friends of C. Freeman Poole which raises funds for the center. She is also their low impact yoga instructor. Inez Finch of East Cobb Senior Center contributes countless hours to the athletic enrichment of youth to seniors in Cobb County and all of Georgia. Inez has been affiliated with USA Track and Field since 1986 and was chosen as the first female president of USATF Georgia Association in 2013. Inez participates in numerous exercise and dance classes at the East Cobb Center and has encouraged many seniors to join her. Ethel Chase of North Cobb Senior Center has served in numerous leadership positions at North Cobb including Site-Council president and secretary. Ethel often assists in the kitchen for various center events. Center members say that Ethel’s humor and kindness makes it a pleasure to know and work with her. Montyne Atkinson of the Senior Wellness Center is a tremendous advocate for physical activity for seniors and has been teaching exercise classes twice a week since the Wellness Center opened in 2012. Montyne has also taught classes at ELM and at the C. Freeman Poole Center. She believes fitness is attainable at any age. Willy Packman of West Cobb Senior Center is one of the first to arrive at West Cobb in the mornings. He sets up the room where he plays pool. Willy is a proponent of pool for increasing mental sharpness, helping with eye hand coordination and balance, and promoting overall health benefits for seniors. He is a member of the Knights of Pythias, a volunteer service organization. 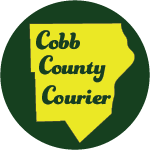 Be the first to comment on "Senior Citizen Council of Cobb County luncheon and awards"